Liver fibrosis is the result of an imbalance between production and dissolution of extracellular matrix. It has been described that Stellate cells, liver myofibroblasts, and bone marrow derived cells converge in a complex interaction with hepatocytes and immune cells to induce response to liver injury. In a recent review, Czaja AJ. (Hepatic inflammation and progressive liver fibrosis in chronic liver disease. World J Gastroenterol 2014; 20(10): 2515-2532) summarized the sequence of events that is independent of the etiological basis for the inflammation and can result in hepatic fibrosis. He represented the cascade of events as such: “Apoptotic bodies derived from the damaged hepatocytes can activate quiescent hepatic stellate cells and Kupffer cells, and these activated cell populations can in turn promote inflammatory and fibrogenic responses. 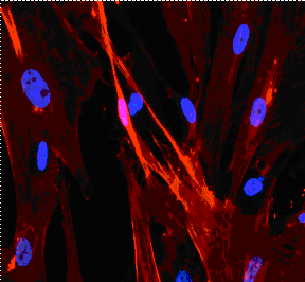 Transforming growth factor beta 1 (TGFβ1), platelet-derived growth factor, and endothelial growth factor can induce the activated hepatic stellate cells to transform into myofibroblasts. The activated hepatic stellate cells can also increase the production of inflammatory chemokines, the expression of adhesion molecules, and the presentation of antigens to T lymphocytes and natural killer T cells. These enhanced inflammatory and immune-mediated responses can promote hepatocyte necrosis and apoptosis and thereby strengthen and perpetuate the stimuli for fibrogenesis.”. Several cell types are involved during this process: hepatocytes, Kupffer cells, hepatic stellate cells and myofibroblasts. I’ll review these different cell types on this blog during the next days.